Portability, easy to use, heightened connectivity. 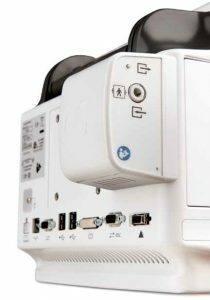 The Qube compact monitor delivers both simplicity and style. Small and lightweight with a battery life that goes the distance, Qube offers portability, accessibility and heightened connectivity—perfect for emergency, general, intensive, and post-anesthesia care units. Caregivers can access current, critical patient information— from bedside throughout transport—to provide the ultimate level of patient care. Qube is mountable virtually anywhere – wall, roll-stand, bed rail, anesthesia system. For immediate mobility, Qube can quickly be detached using a quick-release feature. Long battery life and dual battery capability keep Qube on the go everywhere your patient goes. Impact resistant, chemical resistant, and protected from liquid ingress, Qube endures even with heavy use. Full functionality in a compact package. Data from a variety of sources informs and supports clinical determinations at the bedside or remotely. Graphical assessment tools and the ability to access up to 96 hours of physiologic data empowers clinicians and helps facilitate decision making. Clinicians can customize the screen view to quickly access a multitude of graphical and tabular trend presentations based on individual patient needs and procedural guidelines. Interactive view, control, and recording for parameters, trends, and calculations can be engaged instantaneously, linking clinicians with patient physiologic data. Qube enables point-of-care decisions that provide ongoing reassurance and confidence to patients and their loved ones. Qube facilitates at-a-glance monitoring with an ultra-bright display featuring large numerics. Multicolor, severity-based lights illuminate on both the front and back of the monitor for enhanced alarm surveillance. The sleek, contemporary details of Qube, including ergonomic user controls and a comfortable grip handle, create a positive impact for caregiver and patient. Art meets technology. The small, compact form of the capnography pod makes it ideal for use with Qube. The Capno Pod measures end-tidal carbon dioxide (EtCO2), minimum CO2, and respiration rate to help determine your patient’s ventilatory, circulatory, and metabolic status. A constant-flow vacuum system maintains a 50ml/minute flow rate through the sample line and automatically compensates for ambient barometric pressure to ensure measurement accuracy. To minimize warm-up time between cases, an integrated Suspend Mode smartly disables gas sampling yet maintains power to the Capno Pod for faster start-up. Designed especially for the Qube monitor, it attaches seamlessly onto the rear of the monitor and is ready in a snap. The Capno Pod is suitable for use on patients of all ages. Learn more about Spacelabs capnography. 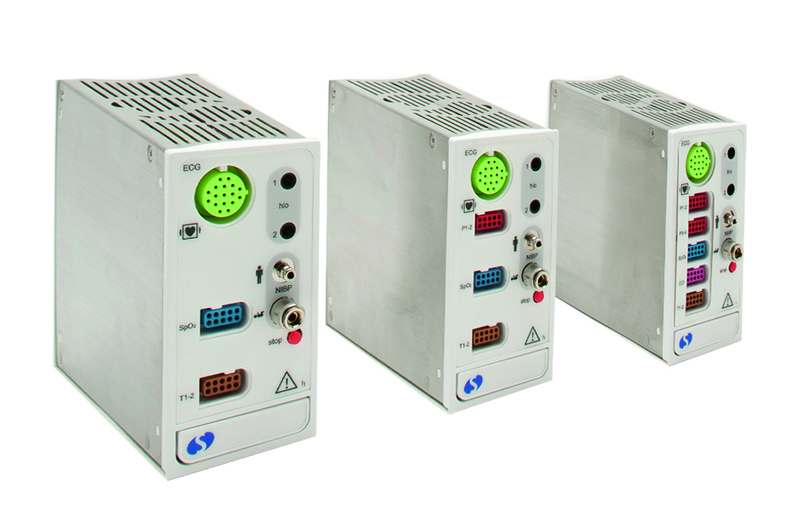 With industry-standard communication protocols Qube provides inter-monitor communication, enhanced alarm surveillance, and broader productivity through both wired and wireless channels. 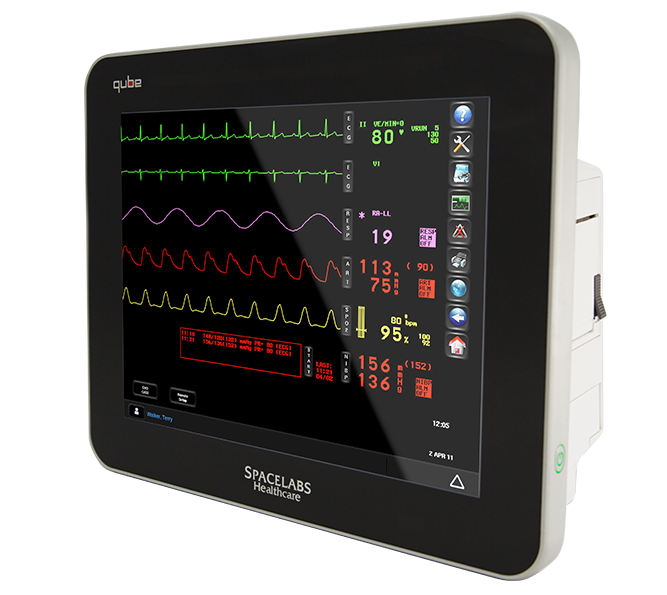 The Qube is also designed for compatibility with the Spacelabs Command Modules, Capnography Pod, and Exergen Temporal Artery Thermometer to provide a versatile, full range of measurement choices. With Spacelabs parameter modules, you can easily select from a variety of configurations to suit the monitoring needs of specific patients or care units in your hospital. For more details on the Command Module and Capnography Pod, refer to the Clinical Parameters page. Features may vary depending on purchased configuration.